One of the largest communities in this region, Aurukun is located on the far west coast of Cape York at the mouth of 3 rivers: the Archer, Watson and Ward. It is approximately 200km south of Weipa along the Peninsula Developmental Road and dependent upon weather and road conditions, the trip between Aurukun and Weipa is about 3 hours. The Wik and Wik Way people have lived in the area for many thousands of years and are recognised as the Traditional Owners for the area between Pormpuraaw and Weipa. The area has 5 recognised clan groups; the Apalech, Winchanam, Wanam, Chara and Puutch. When Archibald Meston reported on the Aboriginal inhabitants of Cape York Peninsula in 1896 he stated that the whole western coast of Cape York Peninsula from the Mitchell River to the Jardine River was in ‘absolute possession of the wild tribes’. In 1904, Arthur Richter, on behalf of the Presbyterian Church, established a mission on this stretch of coastline at the Archer River. Originally named Archer River Mission, Aurukun was never registered under the Industrial Schools and Reformatories Act 1865, which meant that the government did not remove any Aboriginal children from other regions to the community under these legislative provisions. However, 15 removals from Aurukun under the Aboriginals Protection and Restriction of the Sale of Opium Act 1897 (and subsequent amendment Acts) are documented between 1933 and 1943. The majority of people residing in Aurukun are Wik and Wik Way. Richter, in his 1904 report to the Chief Protector of Aborigines, reported that several dialects were spoken amongst the 30 to 40 people at the mission. The mission struggled during Richter’s time, and the permanent population peaked at 51 by the time Richter left in 1913. Deaths outnumbered births, and residents performed all of the physical labour required to build mission facilities and grow food. Many Wik people did maintain traditional living patterns, visiting the mission only periodically. In 1919, the mission was re-located to a nearby site due to water shortages and poor soil quality. Like most Queensland missions, Aurukun was poorly funded throughout its history. In the 1920s, missionaries raised extra income by selling sandalwood and beche-de-mer collected by residents, but these industries became unreliable. Poor sanitation and housing shortages caused ill health, and parasitic infections such as hookworm were common amongst the population. The Reverend J W MacKenzie (Bill MacKenzie) became the superintendent at Aurukun in 1924, and remained in Aurukun in this position with his wife Geraldine until 1965. They were unusually liberal in their support for the continuation of Bora initiations, traditional hunting and use of Wik languages. Bill MacKenzie was, however, known to have an authoritarian personality and harsh punishments throughout his time as superintendent have been documented. Soon after the arrival of the Bill and Geraldine MacKenzie, the population grew as families from the Kendall and Holroyd Rivers settled at the mission. During World War Two, Aurukun residents were encouraged to ‘go bush’ in preparation for a Japanese invasion. MacKenzie recorded in his diary that he released the younger dormitory children to their parents and the decision was made to marry all of the older girls living in the dorms. MacKenzie remained at Aurukun providing coast watch intelligence to the military. Wartime interruptions to industry and employment and funding cuts exacerbated Aurukun’s financial problems, and residents once again endured shortages of food and medicine. The mission became reliant on child endowment monies to buy rations. In the 1950s, a visiting Australian government health team identified cases of tuberculosis at Presbyterian missions including Aurukun. They reported malnutrition, housing and water shortages, and described dormitories as overcrowded and without beds. Residents of Presbyterian missions began protesting about management and living conditions around this time. In 1953, 7 Aurukun men were removed to Palm Island for causing an ‘uprising’ over low wages for compulsory mission work. Northern sections of the Aurukun mission reserve were excised in 1958, when Comalco was granted a bauxite mining lease which also incorporated the majority of Weipa and Mapoon mission reserves. Mining generated long-term uncertainty about the future of Weipa and Mapoon missions, and intensified tensions between the Presbyterian Church, the government and mission residents. When Patrick Killoran, Director of Native Affairs, forcibly removed protesting residents from Mapoon in 1964, distrust was created in the Aurukun community in relation to mining, particularly regarding the government’s commitment to protecting affected communities. In 1975, the Queensland Government, under Premier Bjelke-Petersen, passed legislation which facilitated bauxite mining on the Aurukun Aboriginal Reserve. The Aurukun Associates Agreement Act (1975) (Qld) required a mining consortium to pay 3% of profits into an ‘Aboriginal Welfare Fund’ as compensation to Aurukun mission residents. The government claimed to have consulted the Aurukun community and obtained agreement on the compensatory measures included in the legislation. Aurukun residents, including Donald Peikinna, then Chairman of the Aurukun Council, disagreed and obtained a Supreme Court injunction against Killoran, the Director of the Department of Aboriginal and Islander Advancement. This gave rise to the 1978 case of Corporation of the Director of Aboriginal and Islanders Advancement v Peikinna & Ors. The matter went to the Privy Council in London and mining in the area halted for 3 years pending the Privy Council’s decision. Eventually, the case was lost by Peikinna on appeal and the Queensland Government was granted permission to continue mining the area. During this period, a protest campaign radiated out of Aurukun, drawing national attention to the community’s demand for land and mineral rights. It also made public community concerns about the impact of alcohol on the community, employment opportunities, the protection of sacred sites and environmental issues. Another land rights-centred controversy occurred at Aurukun when the Queensland Government blocked the sale of the Archer River cattle station to the Aboriginal Land Fund Commission in 1976. The property was to be purchased on behalf of Traditional Owners led by John Koowarta, a Winchanam man from Aurukun. Koowarta eventually took the Queensland Government to the Supreme Court, successfully claiming a breach of the Racial Discrimination Act 1975. The Queensland Government responded by claiming that the Racial Discrimination Act 1975 was constitutionally invalid, causing the case to be referred to the High Court. Koowarta’s claim was upheld in May 1982, but not before the government had re-gazetted the property as a National Park. The Presbyterian Church publicly supported Aurukun’s land rights campaigns, pushing its relationship with the Queensland Government to breaking point. The church formally recognised distinct tribal groups, and expressed commitment to land rights by creating numerous outstations to allow tribal groups to return to traditional lands. The Queensland Government strongly opposed outstations, and publicly condemned the movement. In March 1978, when the Privy Council overturned the Supreme Court decision against the Queensland Government in Corporation of the Director of Aboriginal and Islanders Advancement v Peikinna & Ors, Killoran withdrew funding to the Presbyterian Church and assumed administrative control of Aurukun and Mornington Island missions. By this time, Prime Minister Malcolm Fraser was preparing legislation to facilitate self-management at Aurukun and Mornington Island missions after the community requested his intervention. During the time of the Corporation of the Director of Aboriginal and Islanders Advancement v Peikinna & Ors case, the Federal Parliament also acted to pass the Aboriginal and Torres Strait Islanders (Queensland Reserves and Communities Self-Management) Act 1978 through the House of Representatives in April 1978. The Act provided Aboriginal Councils or residents of reserves the option of applying to the Australian Government for self-management. While the legislation was being debated in the Senate, the Queensland Government revoked the reserve status of Aurukun and Mornington Island Reserves, rendering the legislation powerless. A highly publicised dispute between the Australian and Queensland governments under the leadership of Prime Minister Malcolm Fraser and Queensland Premier Bjelke-Peterson developed after Premier Bjelke-Petersen refused to negotiate. Eventually, both governments agreed to facilitate self-management through the creation of local government authorities at both Mornington Island and Aurukun communities. The Aurukun and Mornington Island Shire Councils were constituted with the introduction of the Local Government (Aboriginal Lands) Act 1978. A renewable 50 year lease of former reserve lands was issued to both councils. In July 1978, Aurukun councillors attempted to oust the government-appointed administrators from their community. However government representatives were able to remain in the community by living in the school building which was located on land gazetted for state purposes. In August 1978, Premier Bjelke-Petersen flew to Mornington Island to meet with Aboriginal councillors, but they refused to attend the meeting. When he met with Aurukun councillors they demanded that the Queensland Government let the Australian Government assume administrative control of the community. In August 1978, the Aurukun and Mornington Island Councils were dissolved by the Queensland Government. Wik Peoples and Thayorre People v Queensland (1996) 187 CLR 1 (‘Pastoral Leases Case’). Aurukun Shire Council Population < http://aurukun.qld.gov.au/shire-profile/our-shire/population/> at 14 July 2013. Archibald Meston, Report on the Aboriginals of Queensland (Government Printer, Brisbane, 1896). Regina Ganter, German Missionaries in Queensland (Griffith University, date unknown) <http://missionaries.griffith.edu.au/qld-mission/aurukun-1904-1913#_edn5> at 8 November 2012; Queensland, Annual Report of the Chief Protector of Aboriginals for 1904 (1905) 13, 17-18. Queensland, Annual Report of the Chief Protector of Aboriginals for 1910 (1911) 31. Department of Aboriginal and Torres Strait Islander Partnerships, Community and Personal Histories Removals Database ( access restricted). Aurukun Shire Council Population< http://aurukun.qld.gov.au/shire-profile/our-shire/population/> at 14 July 2013. Queensland, Annual Report of the Chief Protector of Aboriginals for 1904 (1905) 18. Queensland, Annual Report of the Chief Protector of Aboriginals for 1910 (1911) 31-32; Regina Ganter, German Missionaries in Queensland (Griffith University, date unknown) <http://missionaries.griffith.edu.au/qld-mission/aurukun-1904-1913#_edn5> at 8 November 2012. Queensland, Annual Report of the Chief Protector of Aboriginals for 1905 (1906) 22; Queensland, Annual Report of the Chief Protector of Aboriginals for 1907 (1908) 23; Queensland, Annual Report of the Chief Protector of Aboriginals for 1913 (1914) 21; Queensland, Annual Report of the Chief Protector of Aboriginals for 1914 (1915) 17; Queensland, Annual Report of the Chief Protector of Aboriginals for 1930 (1931) 13; Queensland, Annual Report of the Chief Protector of Aboriginals for 1934 (1935) 24; Queensland, Annual Report of the Chief Protector of Aboriginals for 1958 (1959) 57; Queensland, Annual Report of the Chief Protector of Aboriginals for 1963 (1964) 27; Queensland, Native Affairs, Information Contained in Report of Director of Native Affairs for the Twelve Months ended 30th June, 1958 (1959) 16; Director of Native Affairs Office, SRS 505/1, Correspondence Files, File 1H/79, Administration, Child Endowment, Presbyterian Missions (1941-1971). Queensland, Annual Report of the Chief Protector of Aboriginals for 1904 (1905) 22, Queensland, Annual Report of the Chief Protector of Aboriginals for 1906 (1907) 12, Queensland, Annual Report of the Chief Protector of Aboriginals for 1919 (1920) 10. Rosalind Kidd, The Way We Civilize (University of Queensland Press, St Lucia, 1997) 61. Queensland, Annual Report of the Chief Protector of Aboriginals for 1911 (1912) 31; Queensland, Annual Report of the Chief Protector of Aboriginals for 1919 (1920) 10; Queensland, Annual Report of the Chief Protector of Aboriginals for 1920 (1921) 9; Queensland, Annual Report of the Chief Protector of Aboriginals for 1921 (1922) 9; Queensland, Annual Report of the Chief Protector of Aboriginals for 1922 (1923) 9; Queensland, Annual Report of the Chief Protector of Aboriginals for 1924 (1925) 10; Queensland, Annual Report of the Chief Protector of Aboriginals for 1927 (1928) 11. Kidd, above n 12, 93, 98-99. G Wharton, MacKenzie, William Frederick (Bill) (1897–1972) (Australian Dictionary of Biography 2006-2012) <http://adb.anu.edu.au/biography/mackenzie-william-frederick-bill-10988> at 3 April 2013, Queensland, Annual Report of the Chief Protector of Aboriginals for 1924 (1925) 9. P Sutton, The Politics of Suffering (Melbourne University Publishing, 2009) 4; Queensland, Annual Report of the Chief Protector of Aboriginals for 1924 (1925) 10. Kidd, above n 12, 119-121; Wharton, above n 15. Ganter, above n 4; Chief Protector of Aboriginals Office, SRS 4354/1, Papers of the Chief Protector, Item A/58915, Report on Visit to Mission Stations (1938); Queensland, Annual Report of the Chief Protector of Aboriginals for 1936 (date unknown) 19. G Mackenzie, Aurukun Diaries (The Aldersgate Press, Melbourne, 1981) 99-104; Kidd, above n 10, 158-162. McKenzie, above n 19, 99-100. MS2483/4, Letter from William McKenzie to J RB Love 9.02.1943. G Wharton, The Day They Burned Mapoon: a study of the closure of a Queensland Presbyterian Mission (Unpublished honours thesis, University of Queensland, Brisbane, 1996) 43; Kidd, above n 12, 158-162, 166-168. In Aurukun, children had always lived in dormitories, but direct endowment payments to the Church provided a financial incentive to house children in dormitories. Aurukun’s dormitory population more than doubled between 1941 and 1958 (77 in 1941, to 206 in 1958). See: Director of Native Affairs Office, SRS 505/1, Correspondence Files, File 1H/79, Administration, Child Endowment, Presbyterian Missions (1941-1971); Queensland, Annual Report of the Chief Protector of Aboriginals for the year ending 1950 (1951) 5; Kidd, above n 12, 167-168, 497 and footnote 52; Standing Committee on Legal and Constitutional Affairs, Unfinished business: Indigenous stolen wages (2006) s3:2. Kidd, above n 12, 192-198; R. Kidd, Regulating Bodies: administration and Aborigines in Queensland 1840-1988 (Unpublished PhD thesis, Griffith University, Brisbane, 1994) 489, 494-497 (see footnote 52 – original source O’Leary to Under Secretary, 15 March 1953 (QSA Item ID SRS 505/1, 6G/20) and Report on visit to Aboriginal Mission Stations, Gulf of Carpentaria, 9 May 1950 (SRS 505/1, 1D/133)). Kidd, above n 12, 168-169, 195-197; Wharton, above n 23, 46-54. Director of Native Affairs Office, SRS 505/1, Correspondence Files, File 6A/23, Aurukun Mission, Reports on Conduct of Inmates (1953-1975). Kidd, above n 25, 503-523; Wharton, above n 23, 69-89. Wharton, above n 23, 46-54; Kidd, above n 14,193-197; Kidd, above n 25, 494-503. Kidd, above n 25, 503-523; Wharton, above n 23, 63-69 (originals not cited - Director of Native Affairs Office, SRS 505/3, Correspondence Files, File 6D/25, Missions, Mapoon, Proposed Removal to New Site (1958-1963); Aboriginal and Islanders Advancement Department, SRS 127/1, Reports, Box 1, STU 5/01, Comalco Ltd, Aborigines and Islanders at Weipa (1975-1984)). Aboriginal and Islanders Advancement Department, SRS 505/1, Correspondence Files, File 6A/35, Aurukun Mission, Authority to Prospect, Tipperary Land Corporation, Aurukun Associates Agreement Act 1975 (1975-1985); Aboriginal and Islanders Advancement Department, SRS 505/1, Correspondence Files, File 6A/35, Aurukun Mission, Bauxite Correspondence, Authority to Prospect, Tipperary Land Corporation (1975-1977). The Aurukun community claim not to have accepted the 3 per cent share and the company’s commitment to keep the Aurukun people informed about mining developments. See: Aboriginal and Islanders Advancement Department, SRS 505/1, Correspondence Files, File 6A/35, Aurukun Mission, Bauxite Correspondence, Authority to Prospect, Tipperary Land Corporation (1975-1977). This was supported by the Presbyterian Church, and financed by the Australian government. The Supreme Court injunction was lodged on 2 December 1975 before the third reading of the Aurukun Associates Agreement Act 1975. See: Aboriginal and Islanders Advancement Department , SRS 505/1, Correspondence Files, File 6A/35, Aurukun Mission, Bauxite Correspondence, Authority to Prospect, Tipperary Land Corporation (1975-1977); Corporation of the Director of Aboriginal and Islanders Advancement v Peikinna & Ors (1978) 52 ALJR 286. Author unknown, title unknown, Courier Mail, 11 December 1975; Author unknown, title unknown, Courier Mail, 22 December 1975; Aboriginal and Islanders Advancement Department , SRS 505/1, Correspondence Files, File 6A/35, Aurukun Mission, Bauxite Correspondence, Authority to Prospect, Tipperary Land Corporation (1975-1977); Aboriginal and Islanders Advancement Department, SRS 505/1, Correspondence Files, File 6A/35, Aurukun Mission, Authority to Prospect, Tipperary Land Corporation, Aurukun Associates Agreement Act 1975 (1975-1985). In the Supreme Court, the Queensland government provided evidence that their decision to refuse the transfer of the land was a Cabinet Policy of September 1972, which stated ‘The Queensland Government does not view favourable proposals to acquire large areas of additional freehold or leasehold land for development by Aborigines or Aboriginal groups in isolation’. The Aboriginal Land Fund Commission no longer exists, but was set up to purchase land for Aboriginal people to allow them to remain on country. The Act under which it was constituted was the Aboriginal Land Fund Act 1974, which was repealed on 1 July 1980. This Act was intrinsic to the Commonwealth land rights philosophies which emerged under the Whitlam Government. The Act was conceived from the recommendations of Mr Justice A.E. Woodward, whose Commission to examine a ‘means to recognise and establish traditional rights and interests of Aborigines in relation to land’ was established by the Federal Government on 8 February 1973. See: Department of Aboriginal and Torres Strait Islander Partnerships, 8J/873, Confidential Head Office Personal File, media release by the Aboriginal and Torres Strait Islander Legal Service, 25.08.1981 and letter by Minister for Water Resources and Aboriginal and Island Affairs, K.B. Tomkins, to Acting Crown Solicitor, 3.08.1981. Koowarta v Bjelke-Petersen (1982) 153 CLR 168. Kidd, above n 12, 327-328. Aboriginal and Islanders Advancement Department, SRS 505/1, Correspondence Files, File 6A/35, Aurukun Mission, Bauxite Correspondence, Authority to Prospect, Tipperary Land Corporation (1975-1977); P. Sutton, The Politics of Suffering (Melbourne University Publishing, 2009), 21-25; Aboriginal and Islanders Advancement Department, Regional District Office, Cairns, GF/133 Correspondence Files, Aurukun Community, Part 1, Statement by Minister C. R. Porter in Qld Legislative Assembly of Queensland, 5.04.1978; F. Brennan, Land Rights Queensland style – The struggle for Aboriginal self-management (University of Queensland Press, St Lucia, 1992) 10; Aboriginal and Islanders Advancement Department, SRS 9949/1, Correspondence Files, Aurukun Aboriginal Mission. Director of Native Affairs Office, SRS 505/1, Correspondence Files, File 1E/58, Part 2, Administration, Missions, Government Subsidies and Grants, Presbyterian Missions (1971-1978); Aboriginal and Islanders Advancement Department, Regional District Office, Cairns, GF/133 Correspondence Files, Aurukun Community, Part 1, letter dated 21.03.1978; MS1525, Presbyterian Church of Australia, Aurukun Mission Papers. NAA Series A12909 (Barcode 8147067) Commonwealth of Australia, Cabinet Office, Cabinet Minutes, Cabinet Submission no. 2046: Proposed Queensland Government Takeover of Management of Aurukun and Mornington Island Missions (22.03.1978); MS1525, Presbyterian Church of Australia, Aurukun Mission Papers. Aboriginal and Islanders Advancement Department, Regional District Office, Cairns, GF/133 Correspondence Files, Aurukun Community, Part 1 (1975-1984); Kidd, above n 10, 296-297; Queensland, Queensland Government Gazette (extraordinary), 6.04.1978, No.75:141. Aboriginal and Islanders Advancement Department, SRS 505/1, Correspondence Files, File 6A/35, Aurukun Mission, Authority to Prospect, Tipperary Land Corporation, Aurukun Associates Agreement Act 1975 (1975-1985); Aboriginal and Islanders Advancement Department, SRS 505/1, Correspondence Files, File 6A/35, Part 2, Aurukun Mission, Bauxite Correspondence (1973-1977). MS1525, Presbyterian Church of Australia, Aurukun Mission Papers. Author unknown, ‘Aboriginal Councils Likely to be Sacked’, Cairns Post, 12 August1978; Queensland, Queensland Government Gazette, 15 August 1978. 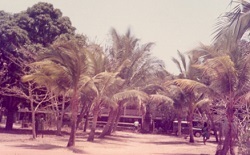 Photo of Aurukun mission house from October 1973.